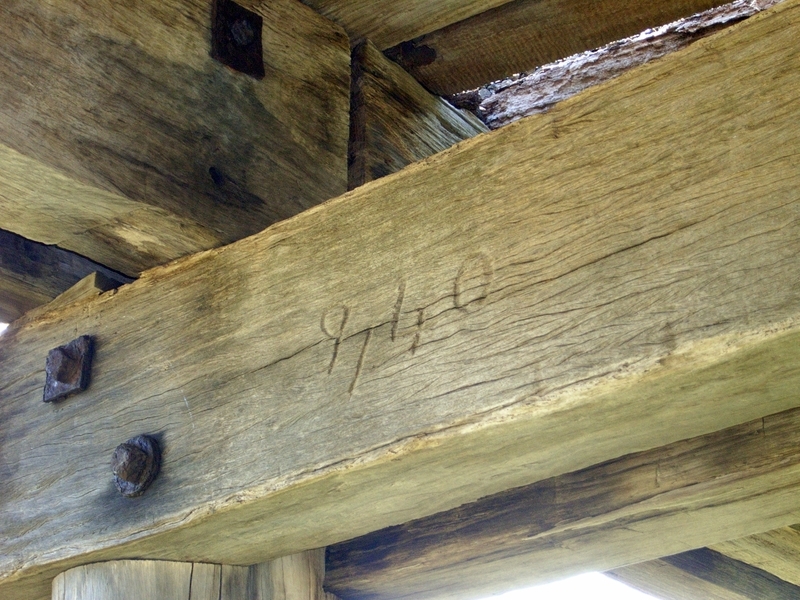 Dennington Railway Bridge is a long single-track railway bridge of timber-beam on timber piers construction built in 1890 as an important component of the Warrnambool-Koroit section of the Terang-Port Fairy Railway. The bridge spans the Merri River immediately west of Dennington township in an area of open treeless farmland making the long low bridge visible from a considerable distance. Completion of the Warrnambool-Port Fairy sections of the railway allowed the rapid transport of fresh fish and crayfish from the coast and potatoes and onions from the Koroit area via the Dennington Bridge to the metropolitan markets of Melbourne and Geelong. The section of railway line between Warrnambool and Koroit for which the Dennington Railway Bridge was created, was also a key link-section providing access to a wide-ranging network of western Victorian railways linked up through major railway-junction points at Koroit, Hamilton, Horsham and Ararat. From the 1890s the railways were able to provide more efficient transport than road haulage to coastal steamers and competition to the shipping of Warrnambool, Belfast and Portland, that had previously provided the far Western District's main freight links with Melbourne and the wider world. 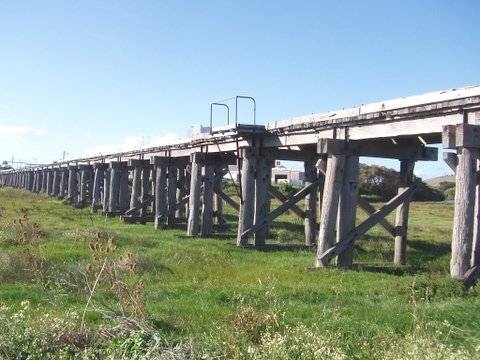 The section of rail line from Warrnambool to Port Fairy that includes the Dennington Railway Bridge closed in 1977. Dennington Railway Bridge was constructed to a standard 15 feet (4.6 metres) span length and comprises forty-one spans, giving a total deck length of 188 metres. It was originally constructed to the in the Victorian Railways standard design of 1877 with two piles per pier, braced with stay-piles. The bridge was subsequently converted to its present four piles per pier through the addition of a longer cross head and two outer raked piers as part of a state-wide upgrade of railway bridges following the introduction of heavier and faster trains after 1900. In most bridges this upgrade resulted in the removal of stay piles however at Dennington the main stream section of the bridge retains an extensive and intact system of stay-piles on both the up and down stream sides of each four pile pier, thought to be the largest remaining set of stay piles in Victoria. Dennington Railway Bridge is of historic and scientific (engineering) significance to the State of Victoria. Dennington Bridge is of historic significance as a key component of the Terang-Port Fairy Railway, the final stage of east-west rail service connecting Geelong to Warrnambool and Port Fairy which, when completed in 1890, for the first time enabled the rapid and efficient transport of the agricultural and fishing produce from the far Western Districts to the metropolitan markets of Geelong and Melbourne. 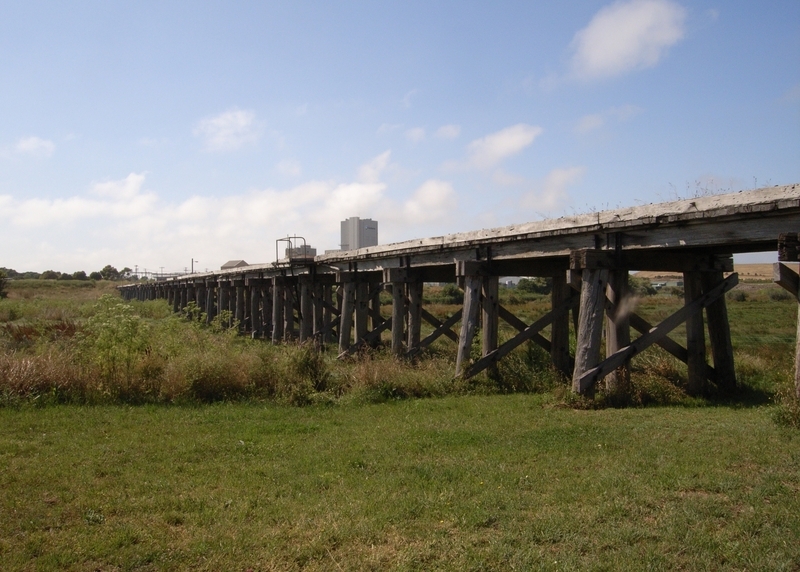 Dennington Bridge is of scientific (engineering) significance to the state of Victoria in being the most intact surviving example of a large timber-beam rail bridge with an extensive system of stay-piles on either side of its main river-channel section. Dennington Railway Bridge with its deck length of 188 metres is also of significance as the fourth-longest surviving rail bridge built to the standard Victorian Railways fifteen-feet (4.6 metre) timber-beam-span design, developed in the 1870s. 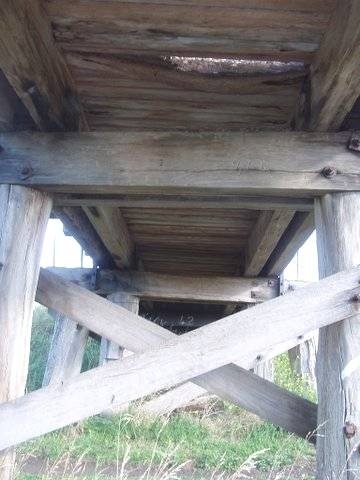 A small number of surviving early long timber railway bridges of this design include the bridge over the Wannon River on the Branxholme - Casterton line (1884, 293 metres); the Yarra Glen viaduct on the Lilydale Healesville line (1880s, 260 metres) and the Latrobe River overflow bridge on the Traralgon - Stratford line (1877, 242 metres). The Dennington Bridge is of aesthetic significance at a local level for the contribution of the long low timber bridge to the rolling farmland landscape of the Western District. Railway Bridge, Merri River, Dennington. 1. The bridge structure marked B1 on Diagram 0151 held by the Executive Director. 2. 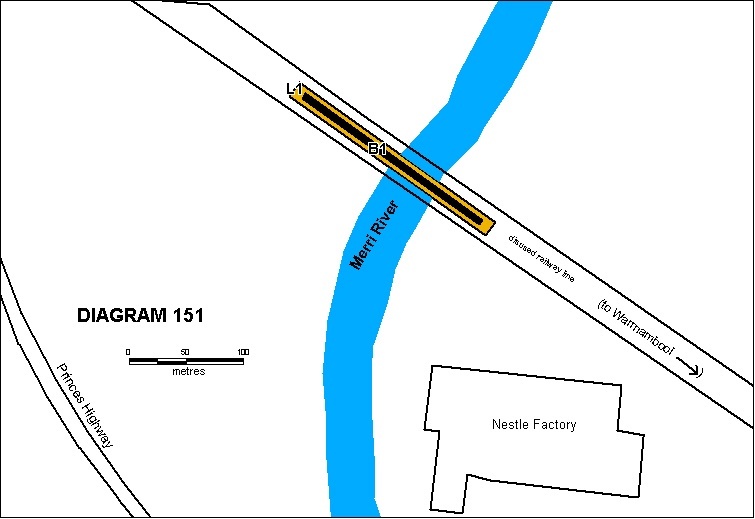 All the land marked L1 on Diagram 0151 held by the Executive Director including 5 metres on the upstream and downstream sides of the bridge and 10 metres at either end of the bridge. This large, 188 metre timber-beam rail bridge with a standard ?15 feet? 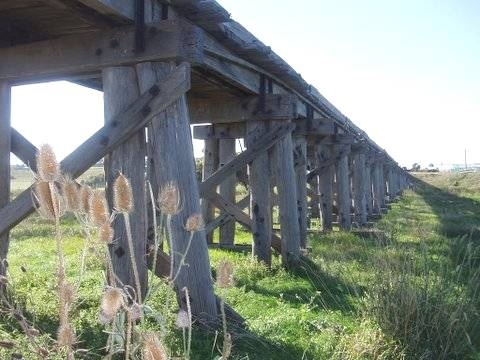 span length was constructed in 1890 as a key component of the Warrnambool-Koroit section of the Terang-Port Fairy Railway. General Conditions: 1. All exempted alterations are to be planned and carried out in a manner which prevents damage to the fabric of the registered place or object. General Conditions: 2. Should it become apparent during further inspection or the carrying out of works that original or previously hidden or inaccessible details of the place or object are revealed which relate to the significance of the place or object, then the exemption covering such works shall cease and Heritage Victoria shall be notified as soon as possible. General Conditions: 3. If there is a conservation policy and planendorsed by the Executive Director, all works shall be in accordance with it. Note: The existence of a Conservation Management Plan or a Heritage Action Plan endorsed by the Executive Director, Heritage Victoria provides guidance for the management of the heritage values associated with the site. It may not be necessary to obtain a heritage permit for certain works specified in the management plan. General Conditions: 4. Nothing in this determination prevents the Executive Director from amending or rescinding all or any of the permit exemptions. General Conditions: 5. Nothing in this determination exempts owners or their agents from the responsibility to seek relevant planning or building permits from the responsible authorities where applicable. Regular Site Maintenance : The following site maintenance works are permit exempt under section 66 of the Heritage Act 1995: a) regular site maintenance provided the works do not involve the removal or destruction of any significant above-ground features or sub-surface archaeological artefacts or deposits; b) the maintenance of an item to retain its conditions or operation without the removal of or damage to the existing fabric or the introduction of new materials; c) cleaning including the removal of surface deposits, organic growths, or graffiti by the use of low pressure water and natural detergents and mild brushing and scrubbing; d) repairs, conservation and maintenance to plaques, memorials, roads and paths, fences and gates and drainage and irrigation. e) the replacement of existing services such as cabling, plumbing, wiring and fire services that uses existing routes, conduits or voids, and does not involve damage to or the removal of significant fabric. Note: Surface patina which has developed on the fabric may be an important part of the item's significance and if so needs to be preserved during maintenance and cleaning. Note: Any new materials used for repair must not exacerbate the decay of existing fabric due to chemical incompatibility, obscure existing fabric or limit access to existing fabric for future maintenance. Repair must maximise protection and retention of fabric and include the conservation of existing details or elements. Fire Suppression Duties : The following fire suppression duties are permit exempt under section 66 of the Heritage Act 1995, a) Fire suppression and fire fighting duties provided the works do not involve the removal or destruction of any significant above-ground features or sub-surface archaeological artefacts or deposits; b) Fire suppression activities such as fuel reduction burns, and fire control line construction, provided all significant historical and archaeological features are appropriately recognised and protected; Note: Fire management authorities should be aware of the location, extent and significance of historical and archaeological places when developing fire suppression and fire fighting strategies. The importance of places listed in the Heritage Register must be considered when strategies for fire suppression and management are being developed. Weed and Vermin Control : The following weed and vermin control activities are permit exempt under section 66 of the Heritage Act 1995, a) Weed and vermin control activities provided the works do not involve the removal or destruction of any significant above-ground features or sub-surface archaeological artefacts or deposits; Note: Particular care must be taken with weed and vermin control works where such activities may have a detrimental affect on the significant fabric of a place. Such works may include the removal of ivy, moss or lichen from an historic structure or feature, or the removal of burrows from a site that has archaeological values. Landscape Maintenance : The following landscape maintenance works are permit exempt under section 66 of the Heritage Act 1995, a) landscape maintenance works provided the activities do not involve the removal or destruction of any significant above-ground features or sub-surface archaeological artefacts or deposits; b) watering, mowing, top-dressing and fertilising necessary for the continued health of plants, without damage or major alterations to layout, contours, plant species or other significant landscape features; Public Safety and Security : The following public safety and security activities are permit exempt under section 66 of the Heritage Act 1995, a) public safety and security activities provided the works do not involve the removal or destruction of any significant above-ground structures or sub-surface archaeological artefacts or deposits; b) the erection of temporary security fencing, scaffolding, hoardings or surveillance systems to prevent unauthorised access or secure public safety which will not adversely affect significant fabric of the place including archaeological features; c) development including emergency stabilisation necessary to secure safety where a site feature has been irreparably damaged or destabilised and represents a safety risk to its users or the public. Note: Urgent or emergency site works are to be undertaken by an appropriately qualified specialist such as a structural engineer, or other heritage professional. Signage and Site Interpretation : The following Signage and Site Interpretation activities are permit exempt under section 66 of the Heritage Act 1995, a) signage and site interpretation activities provided the works do not involve the removal or destruction of any significant above-ground structures or sub-surface archaeological artefacts or deposits; b) the erection of non-illuminated signage for the purpose of ensuring public safety or to assist in the interpretation of the heritage significance of the place or object and which will not adversely affect significant fabric including landscape or archaeological features of the place or obstruct significant views of and from heritage values or items; c) signage and site interpretation products must be located and be of a suitable size so as not to obscure or damage significant fabric of the place; d) signage and site interpretation products must be able to be later removed without causing damage to the significant fabric of the place; Note: The development of signage and site interpretation products must be consistent in the use of format, text, logos, themes and other display materials. Note: Where possible, the signage and interpretation material should be consistent with other schemes developed on similar or associated sites. 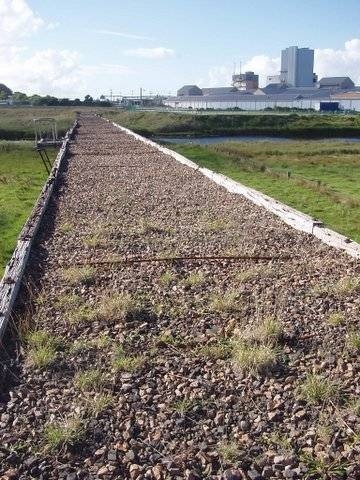 It may be necessary to consult with land managers and other stakeholders concerning existing schemes and strategies for signage and site interpretation. Minor Works : Note: Any Minor Works that in the opinion of the Executive Director will not adversely affect the heritage significance of the place may be exempt from the permit requirements of the Heritage Act. A person proposing to undertake minor works may submit a proposal to the Executive Director. If the Executive Director is satisfied that the proposed works will not adversely affect the heritage values of the site, the applicant may be exempted from the requirement to obtain a heritage permit. If an applicant is uncertain whether a heritage permit is required, it is recommended that the permits co-ordinator be contacted. It is the purpose of the permit exemptions to enable routine maintenance and repairs which do not damage the significant fabric of the place, or diminish its cultural significance. Dennington Railway Bridge is significant for the method of its construction. Any proposed works that would replace or alter the fabric of the structure, or adversely affect any understanding of it should be avoided. A permit will be required for any substantial alterations.